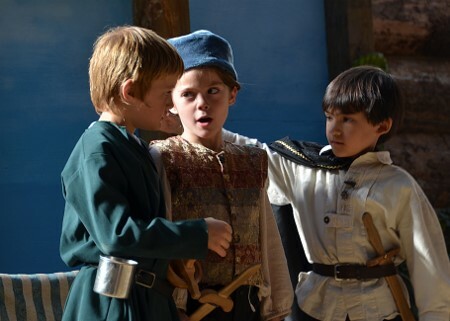 Guest contributor Andee Kinzy is the director of ImprovEd Shakespeare, a playground where kids and Shakespeare explore the past, the present, and the future—improving upon our own introductions to Shakespeare education. Shakespeare, ugh. For many of us, the name conjures up feelings of dread. We’re reminded of the fact that we just never understood the archaic language, and if anyone drags us to see a Shakespeare show—it’s usually time to catch up on our sleep. So if we, ourselves, are not excited about Shakespeare, why should we bother introducing Shakespeare to our kids? It can wait ’til high school, right? Wrong. You should be introducing your kids to Shakespeare now. Think about it: the entire world is new to your children. 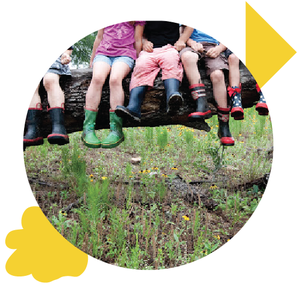 As they’re growing, they are adding new experiences to their knowledge on a daily basis. If you can get Shakespeare in their hands before they reach the age of “coolness,” he’s just another new experience. There’s nothing scary or intimidating about new experiences when your purpose in life is to experience everything. What about the language, you ask? I say, they’re learning new words every day. What about the adult themes, you wonder? Sure, there are some Shakespeare plots that should be left for later years. But for the most part, Shakespeare is following story themes that are ingrained in human psyche. In fact, much of the so-called “children’s fare” shares some of the same plots. The Lion King? Hamlet. Beauty and the Beast? Gaston is a bit like Lady M riling her husband up to kill the king. And let’s not forget Gnomeo and Juliet. Okay, so this is all great and good, but how are you, a Shakespeare-phobe, going to add yet another of those things-to-make-you-feel-guilty-because-you-haven’t-exposed-your-child-to-it-yet to your To Do list? There’s too much, already! Pull up some of those famous quotes you hear all the time (everyone knows at least part of a Shakespeare quote) and ruminate on your daily happenings: “To be or not to be cooking dinner tonight?” “All the world’s a stage, and you, my little imp, belong on it.” “Out, out, darn spot!” The internet abounds with famous quotes, but if you’re feeling the need for more, these can get you started. Every time you use a word given to us by Shakespeare, say, “Thank you, Shakespeare!” Here are a few common ones: belongings (“Don’t forget your belongings! Thank you, Shakespeare!”); eventful (“Well, that was an eventful day! Thank you, Shakespeare!”); eyeball (“Ow! There’s something on my eyeball! Thank you, Shakespeare!”). Need some more suggestions? Check out some Shakespeare stories from the library: Tales from Shakespeare, by Marcia Williams; any of the Shakespeare for Kids books by Lois Burdett; Bruce Coville’s Shakespeare books; or a different Tales From Shakespeare, by Tina Packer. Before you know it, you and your kids will be bedazzled (Thank you, Shakespeare!) by the bard and ready to welcome his fun into your lives. Or, if you live in Austin and are ready for more Shakespeare, check out a full-length production. Present Co. is performing The Tempest in October. Use one of those books from the library to introduce the story beforehand. And, of course, there’s always our ImprovEd Shakespeare productions. One sure-fire way to get your kids excited about Shakespeare is seeing his work performed by kids, for kids. This November we present Henry IV (Part 1!). 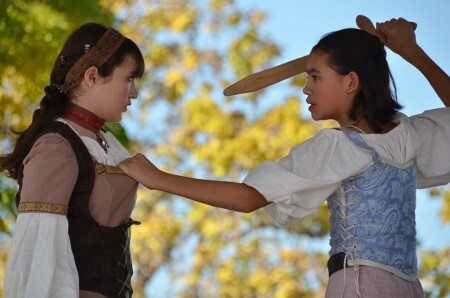 For more information about performances and Shakespeare for kids, visit our website or follow us on social media.